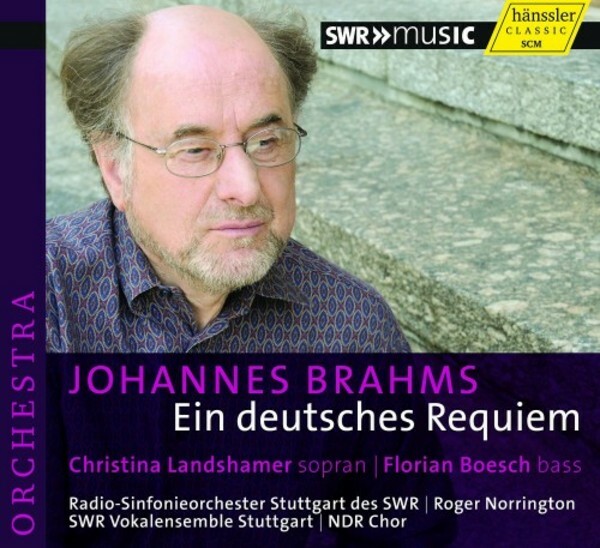 Among the major choral-orchestral works of the 19th century, Sir Roger Norrington and his former Orchestra, the Radio-Sinfonieorchester Stuttgart des SWR, have tackled over the years, now finally comes Brahms' 'German Requiem', one of the most beautiful and popular sacred music works in the repertoire. Brahms� contemporaries, including his close friend Clara Schumann, were moved with the score and were enthusiastic about it - and it has been a favourite with the general public ever since. Although Biblical texts are used, the piece is not in the standard church-liturgical tradition. It was Brahms� personal response to "those who mourn". The central idea of this masterpiece is the reality of human existence. It is precisely this "earthly character� that Roger Norrington uses to shape his interpretation, emphasizing the grave beautify of the music and not religious awe. In this, Norrington draws us close to the composer�s intentions. He is ably supported by soprano soloist Christina Landshamer, bass Florian Boesch, SWR Vokalensemble Stuttgart and the NDR Choir.